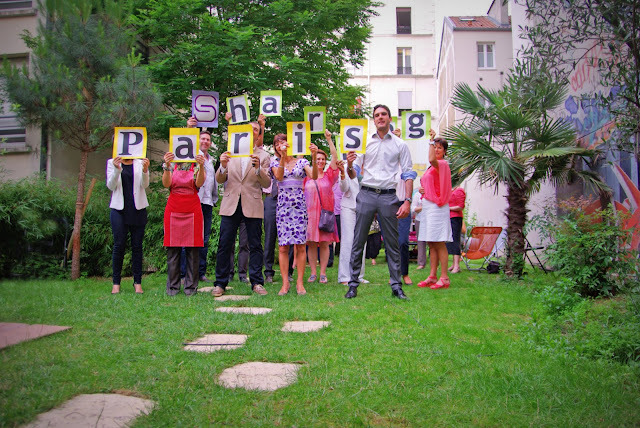 Last evening I was invited to a little gathering organized by Paris-Sharing, one of the sites that provides vacation rentals, home exchange and B&B in Paris (of course this one does it better ;-). It took place in one of the apartments - well I should rather say houses - they have for rent. A real dream place, coincidentally located just a block away (in French we say "pâté de maison") from the Juillet street of yesterday's post. It's what we call an "architect house", with a real garden and plenty of space (check out here), which is pretty rare in Paris. The weather was perfect and the company very cosmopolitan, which was fun. I had a real nice time. When we came to Paris we rented an apartment. If you're going to be there for more than a day or two, I think it's the way to go. Petrea's right. I've rented several wonderful places in different neighborhoods, and they've all been nice. I'm making note of this company for the next trip. It's been way too long. Gotta get back to Paris! That sounds much more inviting than a hotel! I would love to try that! Having rented apartments around the city, I can attest to the fact of how wonderful it is to have your own place and especially, discover new neighborhoods. Nothing like the local boulangerie knowing that you like your bread pas trop cuit. Did I spell that correctly??? I used a similar site to find my last apartment in Paris and can highly recommend this kind of accommodation to anyone planning on staying for a week or longer. Even though it's not always cheaper the range of options is not only greater, but also far more interesting. If you can afford to book six or more months in advance, whatever you get is likely to be both. ... Also, your landlords may turn out to be as nice as mine, in which case you will also leave Paris having made some new friends! Do it! ... You know you want to! The house is beyond my budget, but it really looks nice. The 20th arrondissement is not very central is it? The "back yard" seems to a veritable botanical garden of trees. Having rented an apartment in the Marais, on Rue Aubriot, I can attest to this being the way to visit for a week or longer. I do the cooking, so I was out shopping often, getting to know the area with unique shops and their owners. I discovered a new cheese. Each morning I would prepare an artfully arranged plate of fruit along with a croissant and cups of coffee. We sat by a window that cranked out and listened to church bells from two different churches. My wife and I often recall the memory. It's good to see "girls" in their summer dresses.I'll be jetting out to Paris next week ( staying in an apartment.You are all right,it is the best way to go),and will be throwing in a few more summer frocks. Thanks to Eric,I have a bunch of fun PDP locations to add to my list of places to visit. Is there any chance that the PDP picnic will be taking place soon? Great picture! Would love to stay somewhere like this one day in Paris. P.S. Glad you liked my T-Shirt. Be sure to send a picture of you wearing it! Renting a place is better than a hotel, for sure. Unfortunately, I will not be making it to Paris this year. It breaks my heart, but it would break even worse if no picnic occurs. Go for it, guys! I guess we're all apartment people here—mine was on the rue des Rosiers last time. This house is too rich for my blood, but what a fabulous place! @Charlie Bowers (Charlie is the son of Lynn (UK Lynn) who comes here now and then. He is 20, has obviously talent and made a T-shirt that I love, so I ordered it! Check it out. Thanks Eric, he does have talent! and I can't wait to see you in the t shirt he designed! Thanks for this tip eric. This is were I will be going when I go to Paris.